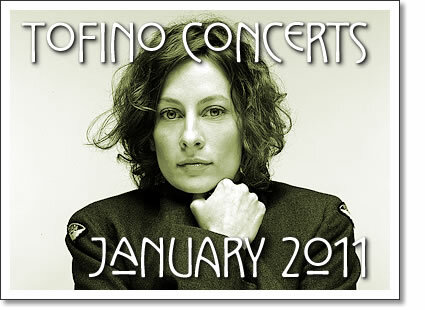 The following concerts in Tofino are happening in the month of January 2011. Tickets for shows at the Tofino Legion are available at Tofitian and Long Beach Surfshop in Tofino. Tickets for events at the Maquinna Pub are available at the door. Visit our Tofino concerts page for concert listings for the current month. Also check our Tofino events for listings of all local events and the Tofino movies page for listings of movies in Tofino. ﻿Arthur Rowe, pianist, and chamber musician returns in the new year to perform an evening of concert piano. Touring annually across North America, he has received enthusiastic reviews for his performances in New York, Cleveland, as well as Europe and New Zealand. Arthur began his professional career while still an undergraduate, at the University of Western Ontario. Renowned cellist and UWO Professor Tsu­yoshi Tsutsumi invited him to play in recital tours in Canada and The United States, and soon after, Mr. Rowe was concertizing in cities across Canada in solo recitals, CBC radio recordings, and concerti. Arthur Rowe is heard frequently on radio broadcasts in both Canada and the US. Tofino concert listings from Tofino Time Magazine. Shows at the Tofino Legion and other music events in Tofino in January 2011.